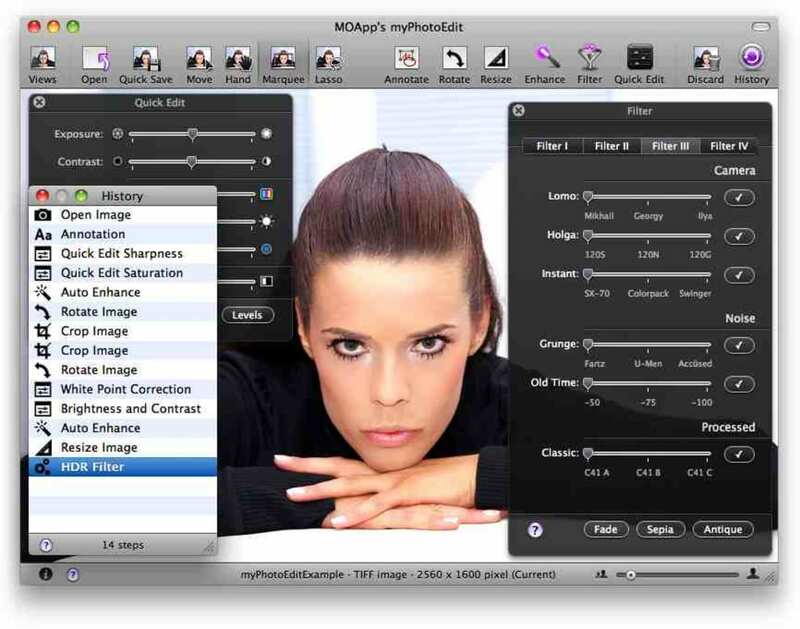 myPhotoEdit is a no nonsense photo editor which provides a powerful but simple way to edit your photos. Once you open the app, there's a first-use guide to help you get to grips with the program although in actual fact, this only leads you to the online manual. myPhotoEdit processes almost all RAW image formats according to the developer and is constantly updated to make sure it supports more. myPhotoEdit automatically creates a backup copy of each opened image so that you never accidentally damage or erase an open image although you can deactivate this in the Preferences. There's also handy My Recent Images menu which allows you to access your most recently accessed images and edits without having to search for them on your hard drive. The overall interface of myPhotoEdit is excellent. There are many impressive effects you can add in a slick translucent menu. All the effects are controlled by sliders that affect your photo in real time, so you can see what you're doing. Mess it up, and you can simply hit reset to undo your changes. There are a few drawbacks to myPhotoEdit. One of them is that obviously, it doesn't feature all the power and features of something like Photoshop. Also, it's only available for OS X 10. 6. 3 and above so even Leopard owners can't use the latest version although there is a download provided here for version 1. 0. 1 which does work. myPhotoEdit is ideal for anyone that's intimidated by apps such as Photoshop, and just want an elegant, functional photo editing application. What do you think about myPhotoEdit? Do you recommend it? Why?